One of the best things about the Star Wars films is that they are so quotable – the lines and phrases have become part of pop culture across so many realms – Yoda’s altered sentence structures, Han’ call it like it is quips and Luke’s bright eyed innocence about wanting to go to Toche Station have made the films live on. From upstanding Jedi to fallen Sith, precious princesses to bickering robots, here’s what we think are the best quotes of the major characters are from six motion picture films of the Star Wars franchise. “You must unlearn what you have learned.” - Some say you can't teach an old dog new tricks. Yoda seemed to think he Luke could with Luke and ultimately he was proven right. “Fear is the path to the dark side. Fear leads to anger. Anger leads to hate. Hate leads to suffering. I sense much fear in you." - A line from Phantom Menance where Yoda is basically outlining what will happen to Anakin Skywalker and the consequences his fear will have for himself, all those around him and beyond. "No, there is another." As Obi Wan Kenobi laments Luke possibly failing and being the last hope, Yoda through into the mix that there was another hope. So says Luke to his Uncle Owen thus showing he's just a whinny farm kid who doesn't respect that he's gotta do his chores. It's also a quote designed to show how far removed Luke is from the perils that Leia recently found herself above the planet. Considering the final scenes of ROTJ feature Luke having his first and final conversation with his dying father (As Anakin, not Vader), this quote shows just how grew up over the course of the Original Trilogy. It's widely accepted that The Empire Strikes Back delivered one of the greatest plot twists in cinema history. Arguably it's second only to original Planet of the Apes. For Luke to find out his father was the man who had just cut his arm off, well, that was pretty good cinema. Luke: I'll not leave you here. I've got to save you. Anakin: You already have, Luke. 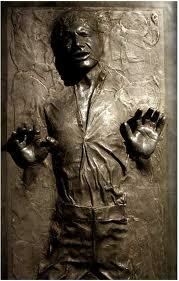 So says Luke in response to a bit of shoving from Ponda Baba and his friend in the Mos Eisley cantina. Which naturally lead to Obi Wan slicing off Ponda Baba's arm which was a great piece of foreshadowing. "I suggest a new strategy, Artoo: let the Wookie win." - Aboard the Millenium Falcon, R2D2 is beating an agitated Chewbacca so C3PO suggests the strategy to placate the hairy goof. "R2-D2 where are you ?" Once again our robot has lost his best friend. "Die Jedi Dogs! Oh what did I say?" C3PO having an out of body experience in Attack of the Clones. Luke and the gang have just escaped the Death Star following the death of Obi Wan Kenobi when Vader sends a squadron of Tie Fighters after them. Luke manages to shot one down and is pretty happy about it when Solo chirps back with this line. Han’s no fool, he’s been around much longer and knows that what they’re going through is life and death…. and that Tarkin let them escape. Han had a giant bounty on his head set by Jabba the Hutt when he said this to Princess Leia. Still, he managed to overlook this long enough to fly in and save the day by getting Vader out of the way so Luke could bring down the Death Star. Leia got to return the favour during the Battle of Endor in ROTJ. Should have paid his debts! Did Chewie say something funny? A quote that has been adopted by many fans for whenever they need to start something such as their car. Why is this infamous? A Parsec is a measurement of distance not time – so Han was simply making an idle boast to impress Obi Wan and young Luke about the speed of the Millennium Falcon. Or was he? Tie-in books have explained that Han meant he cut down the distance commonly traveled on the Kessel run by flying close to Black Holes that no one else had dared to. But the new canon rules have made this explanation defunct. Palpatine was eventually engineered by Lucas as the villain of the prequel trilogy which made his 'cameo' in Return of the Jedi fraught with all kinds of danger and meaning. Here's a selection of quotes. "And you, young Skywalker; we shall watch your career with great interest." Palpatine: Master Yoda. Do you really think it will come to war? Yoda has no idea he is talking to a Sith Lord who has manipulated and entire galaxy into war and Palpatine plays the the part like the brilliant politician he is. The Emperor: Your faith in your friends is yours. While Vader and Palpatine were doing there best to provoke Luke into tapping into the Dark Side of the Force, they went through a bit of banter. Who wasultimately right in this exchange? The coolest thing about this line at the end of Jedi was that this was the Emperor admitting that Luke Skywalker, the kid who once whined about picking about power converters from Tosche Station was now a Jedi. Without Yoda to admit Luke to the Jedi, it was as close as Luke was ever going to get his Jedi Badge pinned to his chest. It was also about the time the Palpatine let forth with a blast of blue Force electricity on Luke. They told me they fixed it! I *trusted* them to *fix* it! It's not my fault! Break off the attack! The shield is still up! We're on our way, Red group, Gold group, all fighters follow me. Ha ha ha, I told you they'd do it!